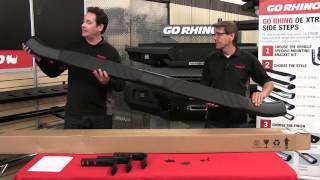 Ben and Pete are in the Go Rhino Garage to cover the installation of one of 2017's hottest products, the Go Rhino Sport Bar 2.0! 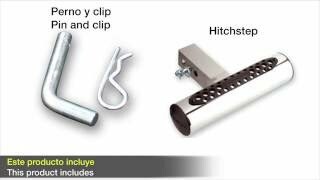 Video topics include the different Sport Bar 2.0 options, demonstration of the power-actuated light mount bar, and bed rail drilling tips. 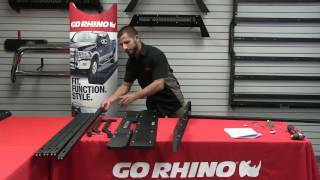 Ben is in the Go Rhino Garage to cover the assembly of the Go Rhino SRM 100 Roof Rack. The modular roof rack is customizable and there are over 100 possible combinations! 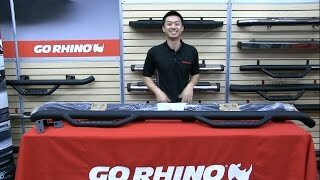 Go Rhino's new generation of BR Bumpers is here! The new BR5.5 has all of the same great features that you loved from the BR5 plus some new features like a built-in 2" front receiver and a hinged cover or easy winch access. 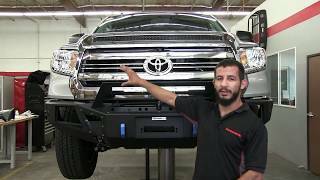 Ben is back in the Go Rhino Garage to cover the installation of the BR5 Front Bumper Replacement for the '07+ Toyota Tundra. Paul & Pete are back in the Go Rhino Garage to go through the installation process for the new BR5 Bumper Replacement from Go Rhino. 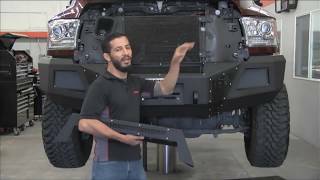 The popular Bumper Replacements are now available for half-ton applications and the Go Rhino crew goes over the features, accessories, and installation tips for the product. 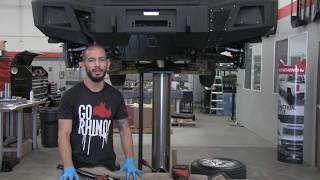 Ben & Pete are in the Go Rhino Garage to cover the installation of the Go Rhino BR10 Bumper Replacement on a 2016 Ram 2500. Note that this is a diesel model and installation may differ on older Ram models. This vehicle also has an aftermarket grille, so there is no video on the removal of the factory grille. Please refer to the installation guide for more information on the grille removal process. 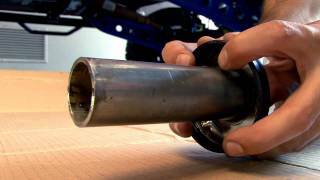 The bumper installation videos keep on coming with the latest from Ben and Pete. 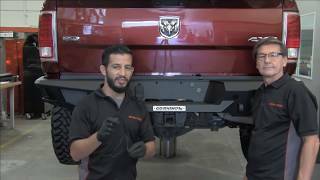 They cover the different aspects of the BR20 Rear Bumper Replacement installation on a Ram 2500 Mega Cab including parking sensor installation. Note that this bumper has been designed for the 2010-2017+ Ram 2500 and 3500. 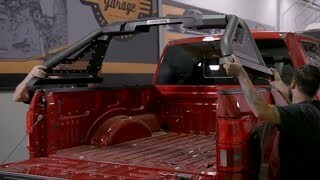 Ben is back in the Go Rhino Garage to cover the BR20 Rear Bumper Replacement for the '07+ Toyota Tundra. 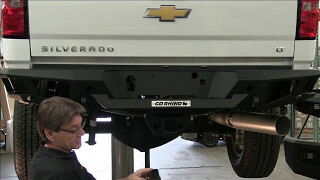 He covers the removal of the stock bumper and end caps, installation of brackets, as well as the special modifications needed on the hitch receiver. 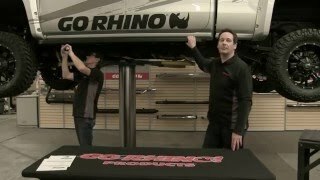 Paul & Pete are back in the Go Rhino Garage to showcase the Go Rhino BR20 Rear Bumper Replacement. 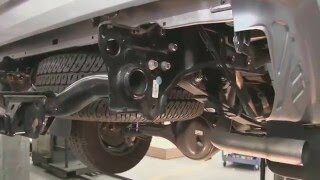 Paul covers differences in installation for different truck upgrades and options and Pete goes through the installation process for the 2015 Chevy Silverado HD version. Ben is back in the Go Rhino Garage to cover the installation of the RC2 LR bull bar on the Chevy Colorado. Note that this is a Z71 model, so check the installation instructions for minor differences in the process for different trim levels. This part number will also work on the 2015+ GMC Canyon. The installation process is the same for all Go Rhino bottom-mounted bull bars, so the process will be the same for any of the 3 RC2 LR designs as well as the RC2 Bull Bar. 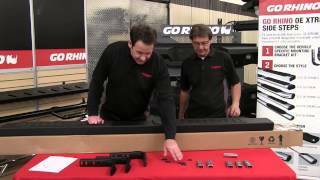 Join Eric & Pete in the Go Rhino Garage as they review the popular Dominator D2 side steps as well as the installation process. 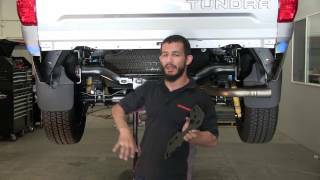 Go Rhino's new Raptor-Style Running Board, the RB10, is already a big hit and Paul & Pete go through the installation process for the 2015 Chevy Silverado 2500 Crew Cab Diesel in the Go Rhino Garage. 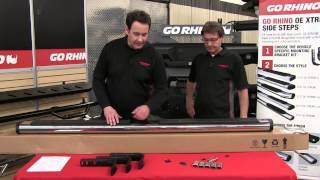 Eric & Ben are in the Go Rhino Garage to detail the installation process of the RB10 Running Boards on a Ram 2500 Crew Cab, including the special "T-plate" installation for rocker panel mounting on the Ram. 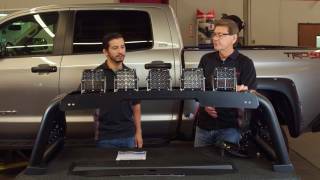 Paul is back in the Go Rhino Garage to introduce a new product that debuted at the SEMA Show in 2015: The RB10 Drop Step accessory. This 4" drop step allows current or new RB10 owners to quickly bolt on this step, allowing easier access into the truck, especially for lifted and taller vehicles! The OE Xtreme side steps is Go Rhino's signature series, as it gives pickup trucks and SUVs a classic OE style look. 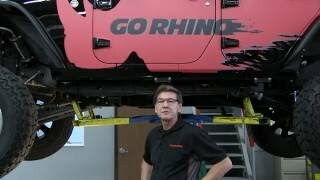 Paul & Pete quickly review the entry-level 4" OE Xtreme and go through the installation process in the Go Rhino Garage. The OE Xtreme side steps is Go Rhino's signature series, as it gives pickup trucks and SUVs a classic OE style look. 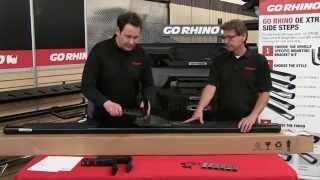 Paul & Pete quickly review the sleek 5" OE Xtreme Low Profile and go through the installation process in the Go Rhino Garage. The OE Xtreme is Go Rhino's signature series of side steps, as it gives pickup trucks and SUVs a classic OE style look. 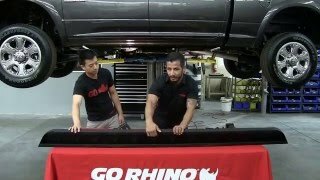 Paul & Pete quickly review the practical 5" OE Xtreme Composite and go through the installation process in the Go Rhino Garage. The OE Xtreme is Go Rhino's signature series of side steps, as it gives pickup trucks and SUVs a classic OE style look. 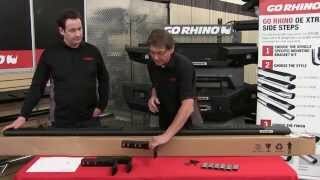 Paul & Pete quickly review the premium 6" OE Xtreme and go through the installation process in the Go Rhino Garage. The OE Xtreme is Go Rhino's signature series of side steps, as it gives pickup trucks and SUVs a classic OE style look. Paul & Pete quickly review the new '14-'15 GM style 6" OE Xtreme II and go through the installation process in the Go Rhino Garage. The Modular 6000 Series SideSteps eliminates the typical struggle of entering and exiting a truck or SUV, offering easy step-up entry and step-down exit. Available in black powder coat, chrome, or polished stainless finishes. Will ship by UPS instead of freight which saves you money on shipping costs! 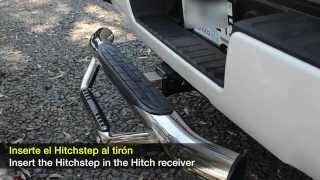 This hitch step has the same great aggressive styling of our popular Dominator sidesteps with a dual step design and foot pads that provide sure footing. 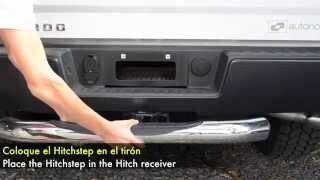 This hitch step provides easy access into the back of your truck or SUV with a secure, solid step. This universal application fits all 2" receivers. This versatile hitch step provides a large, secure step into the back of your truck or SUV and provides protection to molded bumpers. 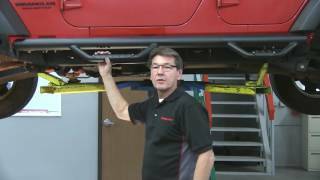 Pete is back in the Go Rhino Garage to cover the installation of the BRJ40 Modular Front Bumper for the Jeep Wrangler JK. He covers the removal of the original bumper, tips for installing the BRJ40, as well as optional add-on accessories available. 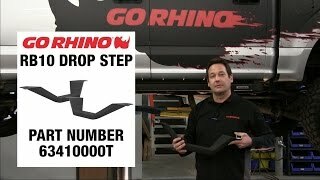 Pete is in the Go Rhino Garage to cover the installation of the Go Rhino BRJ80 Rear Bumper installation process. 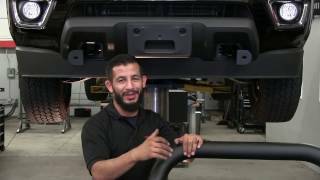 He provides tips on removing the factory bumper, installing the end caps, as well as tips for additional lighting. 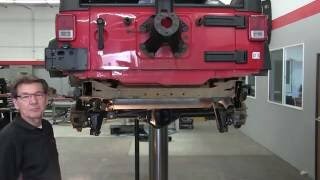 Pete covers the installation process for the RB10 Running Boards on the Jeep Wrangler JK. Pete is back in the Go Rhino Garage to cover the installation of the textured black Dominator D2 side steps for the 4-door Jeep Wrangler JK.